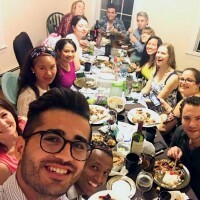 The author’s selfie of himself (front) with friends at a Passover Seder in Boston. MY NAME IS Oday Abdaljawwad. I am a Palestinian who grew up in Gaza and moved to the U.S. about a year ago for my master’s degree. My journey from Gaza to the U.S.—and to Brandeis University, in particular—wasn’t an easy one. After finishing my undergraduate degree in English literature from the Islamic University of Gaza, I applied for a Fulbright scholarship to pursue my M.A. at an American university. During the application process, participants were asked to list four U.S. universities they would like to attend, keeping in mind that the first school in their lists would be considered their first choice. At the top of my list was Brandeis. “I appreciate your valid concerns,” I responded, “but actually the main reason why I chose Brandeis is because it’s Jewish.” I had come upon Brandeis while researching universities that offer MAs in Conflict Resolution. Initially, my Palestinian identity felt very threatened seeing Hebrew letters on the university’s logo. My heart started beating very quickly, and Brandeis seemed an impossible option for me. So I re-visited the Brandeis website and looked at its Conflict Resolution program—and I was impressed. I decided that if I am going to the U.S., I must make it a new experience on every level. I decided to confront the fear inside me that has been building for most of my life, and get to know this Jewish community. Four months later, I finally made it to the U.S. My first day of classes at Brandeis was Aug. 24, 2016. Needless to say, my concerns were not the normal ones of every new student—they were deeper. I was scared of being excluded, scared of being emotionally defensive every time the Palestinian-Israeli conflict was mentioned. The first day of school went smoothly. Going home, I was uncertain which school shuttle to take, so I asked a girl for directions. It turned out we were going to the same part of the city, so I waited with her for the right shuttle. “Where are you from, by the way?” she asked. I arrived home—and for the first time in the past four months, I felt light. All my fears faded away. In the months before I got to Brandeis I had built a thousand scenarios of what my first encounter with an Israeli would be like. Then I met one, and she helped navigate me on my way home. This was symbolic to me. On the second day of school, I met with Regine, a Filipino Muslim student in one of my classes. She had a great interest in the Palestinian-Israeli conflict, since she lived in the West Bank for three months. During our first conversation, we both realized how progressive our perspective is. Together we approached an Israeli classmate, who later invited us to a synagogue he used to attend in Boston. Regine and I were the first Muslims to be invited there. Honestly speaking, I was so worried about how people in the synagogue would perceive me as a Palestinian and as a Muslim. Yet once again, the experience proved my worries and concerns wrong. People there were so friendly to us, and offered us food they grew in their gardens as a way of showing love and kindness. Following a conversation about the Torah with the synagogue’s rabbi, Regine and I were amazed by the tremendous similarities between Islam and Judaism. In addition to learning about the Torah, I got to attend some Jewish holiday celebrations that gave me the opportunity to increase my knowledge and understanding of the Jewish community. The very first Jewish holiday I experienced was Rosh Hashanah, the Jewish New Year. On a beautiful breezy fall day, Regine and I walked around the streets of Cambridge with progressive Jews from Jewish Voice for Peace singing peace songs in both Hebrew and in English. One Rosh Hashanah custom is Tashlikh, where people gather around a body of flowing water and empty their pockets or throw stones into the water, symbolically casting off their sins. On a bridge over the Charles River, people spoke about the necessity of ending Israel’s occupation of Palestine and the Israeli settlements on Palestinian land. Seeing Jewish people acknowledging the crimes of Israel against Palestinians left me speechless. My second favorite Jewish holiday was Sukkot, which commemorates the 40 years the children of Israel wandered in the desert, living in temporary shelters. Hence, on Sukkot people build kits and sleep in them. I got involved in building kits with some Jewish friends, and we spent the whole night in our kit. We worked together, ate together and prayed together. This kit-building process was a real expression of coexistence. It is so sad how the Israeli-Palestinian conflict has been taken to a religious level, making it a Muslim-Jewish conflict. That is why I’m so grateful for this enlightening year at Brandeis which gave me a chance to learn about Judaism. I have made so many Jewish friends, who later told me that they thought all Palestinians were Jew-haters. I came all the way from Gaza to Brandeis to get my MA in Conflict Resolution—but teaching Jewish people about Palestine and Palestinians, and learning from them about Judaism, was just as important.